Mother’s Day on the bench today. 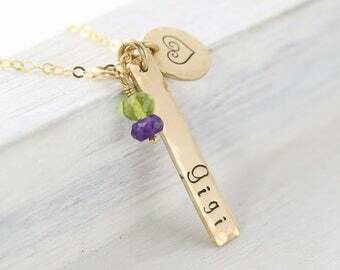 Perfect for a new mom as a push present or just because, this rustic but elegant handcrafted personalized mothers necklace will make a beautiful gift! 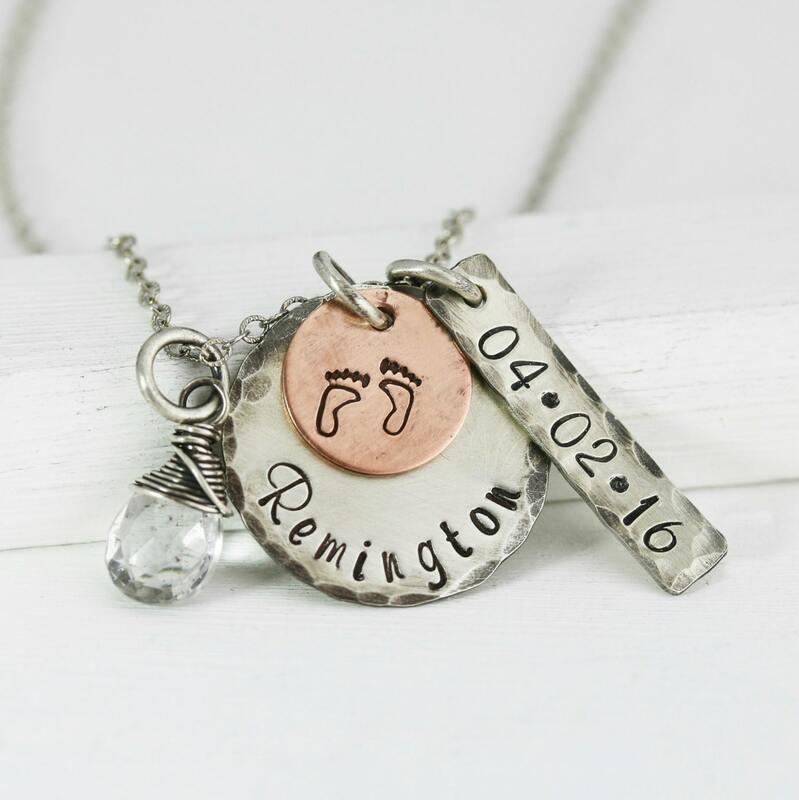 Two metal charms are stamped and layered, one a round sterling silver disc and the other a round copper disc stamped with baby feet, hanging alongside is a rectangle bar stamped with the date. This necklace will make a lovely gift for any mother, new or old. Choose a stone from the 4th picture to be included in this adorable charm cluster. Your metal pieces will be hand cut, hammered, stamped, oxidized and polished creating a rustic patina. The oxidation and removal process creates varied tones of gray and brown giving them a beautiful one of a kind look! 5. Click "Proceed to Checkout" to complete your order! By purchasing this item you acknowledge that you have read and agree to my shop policies http://www.etsy.com/shop/TNineDesign/policy If you have any questions, please contact me. detail. It is VERY important that you refer to dimensions listed above for correct sizing. Copyright © 2011-Present, T·Nine Design. All Rights Reserved. Very quick turnaround! Necklace and engraving met my expectations. Would buy from this seller again! Absolutely perfect! Thank you so much! I ship everything via USPS First Class. As an option, I offer Priority Mail, Express Mail, and International Shipping. Please see individual listing for our current production time shown as "Ready to Ship In" under the Shipping & Policies Tab. * For local orders (Northern California) delivery is usually 1-2 days. * For orders in California ..... delivery is around 2-3 working days. * For domestic (in the US) orders it may take anywhere from 2 to 7 working days. * For international shipments the transit time is 1 to 3 weeks depending on the country. 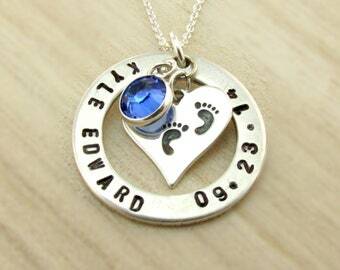 Beauty and character is what is created when carefully crafting a hand stamped piece of jewelry. Please keep in mind that no piece is exactly the same and there will be variations in how the letters align. PERSONALIZED CUSTOM JEWELRY: Is non-refundable, non- returnable because it was made especially for you and according to your specifications, however if there is an error in the jewelry that I have made, I will correct the mistake immediately and re-send the piece ASAP. T·Nine Design is not responsible for lost or damaged items due to normal wear and tear. ~ Humidity can speed up the oxidation process that produces tarnish therefore do not leave jewelry in or near the bathroom. ~ Always remove jewelry before showering or cleaning. A film can form if soap or cleaning agents are not washed off completely. This film will become a magnet for dirt, dust and other contaminants and will also speed the natural tarnishing process. ~ Minimize it's contact to chemicals (hairspray, perfume, body lotion, bleach, etc.) and do not wear it in the shower, swimming pool or hot tub. ~ After taking off jewelry, clean it with a dry soft cloth before putting it back into an airtight container. *****PLEASE NOTE***** all photos have been enlarged in order to show detail. It is VERY important that you refer to dimensions included in listings for correct sizing. If you have questions regarding the size or dimensions, please feel free to contact me before placing an order. If you need larger amounts than what I have listed, please contact me so that I can offer you additional packages which may include a volume discount. Feedback: Your satisfaction is VERY important to me! If for some reason you are not happy with your piece, please contact me. I will work with you to the best of my ability to make it right. All items come from a smoke free home. Your jewelry purchase will come beautifully packaged for gift giving or as a wonderful present to yourself.